Kidma activities started in 1999 as a part of Hasomer Hatzair activity for its senior age group. From the beginning, we were trying to create a community open to all Jewish young adults and the same goal continues today. We would like to interest those Jewish young adults over the age of 18 who are interested in attending cultural events, such as exhibitions, movies, and meeting well-known and interesting personalities. Up until now, Kidma has organized more than 100 different programs, and in the last number of years Kidma can rely on a group of regular members. In 2002, we decided to become an independent organization and established “Kidma Hungary”. The ideology and goals remain similar to Hashomer Hatzair's, but Kidma was established specifically for young adults over the age of 18. Kidma’s main goal is to provide quality free-time activities to Jewish young adults. We would like to have an open community where everyone feels free to join. Our ideology is not based on religion, yet Jewish tradition is important to us. Our programs focus on issues about Israel, Jewish culture and public life in Hungary. Our weekly activities are scheduled for Sundays when we invite guests with interesting and important life stories. Kidma's previous guests have included two Prime Ministers, several members of Parliament, Olympic champions, University professors and an Oscar prize film director. We organize cultural programs and occasionally attend theatre plays and exhibitions which are exceptional or connected to Jewish life. Our “1 Euro movie program”, where we watch movies with Jewish themes, is also very popular. Pixrael is an international online photo contest and open-air exhibition. The project began in the spring of 2008. Our purpose was to introduce Israel in a different way than it has been depicted and known in the mass media. Pixrael shows a picture of Israel from all aspects, from the viewpoint of the average citizen with amazing pictures. We hoped that photos of the exhibition would help to dissolve the barriers of prejudice and would give way to cross cultural and cross religious conversations. The material for the exhibition consisted of 60 photos selected in 2008 and 2009. Our organization just held a major conference on the effects of the Egyptian affair on Israel with significant Hungarian politicians, diplomats and professors. We had hundreds of participants, and a great media coverage. We are committed to helping others and therefore organize many charity activities. It is important for us to cooperate with all the Hungarian Jewish youth movements and organisations, and our goal is to cooperate with other organisations abroad who have goals similar to Kidma. 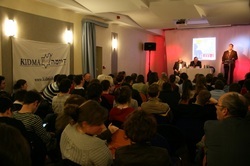 Kidma is supported by Hungarian Jewish Community (Mazsihisz), the Joint Distribution Committee and the Jewish Agency, in addition to members of Kidma and other donors.